From a Pulitzer Prize-nominated journalist specializing in the Middle East, this groundbreaking account of the Syrian Civil War reveals the never-before-published true story of a 21st-century humanitarian disaster. 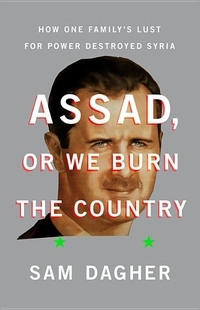 In spring 2011, Syrian President Bashar al-Assad turned to his friend and army commander, Manaf Tlass, for advice about how to respond to Arab Spring-inspired protests. Tlass pushed for conciliation but Assad decided to crush the uprising -- an act which would catapult the country into an eight-year long war, killing almost half a million and fueling terrorism and a global refugee crisis. Assad or We Burn the Country examines Syria's tragedy through the generational saga of the Assad and Tlass families, once deeply intertwined and now estranged in Bashar's bloody quest to preserve his father's inheritance. By drawing on his own reporting experience in Damascus and exclusive interviews with Tlass, Dagher takes readers within palace walls to reveal the family behind the destruction of a country and the chaos of an entire region. Dagher shows how one of the world's most vicious police states came to be and explains how a regional conflict extended globally, engulfing the Middle East and pitting the United States and Russia against one another. Timely, propulsive, and expertly reported, Assad or We Burn the Country is the definitive account of this global crisis, going far beyond the news story that has dominated headlines for years.